I remember watching a documentary about the massacre of Polish officers by Stalin. The documentary showed the children of the Polish officers who for the first time, after the collapse of the Soviet Union, were able to visit the Katyn forests where their heroic fathers had been buried by Stalin's henchmen. Huge trees had grown by the graves of these Polish officers, as tall and proud as the men who lied beneath them. One Polish woman hugged one of the trees, and said 'This is my father' and cried with joy. There is something about trees that represents eternal life, dignity and pride and those Polish children of the massacred officers saw their martyred fathers live on in the lofty trees of Katyn forest in Russia. 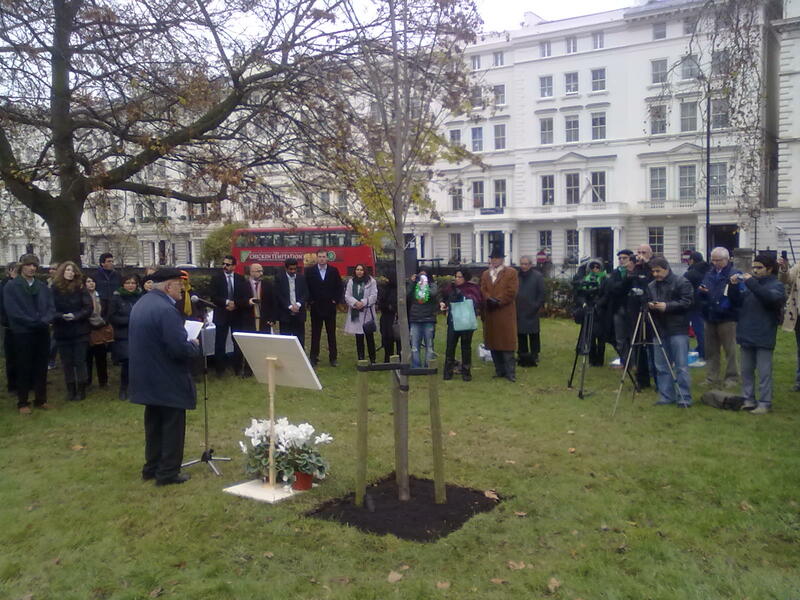 Just opposite the Iranian embassy in London, coinciding with the International Human Rights day, a tree was planted today in honour of the martyrs of Iran's Green Movement. 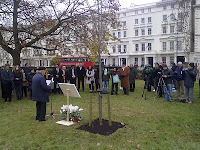 The tree was named Neday-e-Iran, the 'Calling of Iran'. The ceremony started by traditional Persian music played by the flute followed by some speeches and ended with the singing of Ey Iran anthem. Amnesty International's representative, Drewery Dyke, was also there and emphasised the importance of remembering the fallen heroes. I hope Neday-e-Iran tree will one day become huge and enormous, tall with lots of branches and full of green leaves, and remain there overlooking the Iranian embassy long after the present occupiers are gone. More sickening exploitation of the woman who had nothing whatsoever to do with the political movement that has completely usurped her memory. Potkin, can people like you stoop any lower? Meanwhile, the man who knows the real killer of Neda is free to do as he pleases in the UK. He is feted by Martin Fletcher of the Times as well as the BBC. Let me remind you all again that Hejazi lied about the death of Neda. He claimed she was shot in the heart by a rooftop sniper (no doubt a foreign agent) but then changed it to a Basiji on a motorcycle.